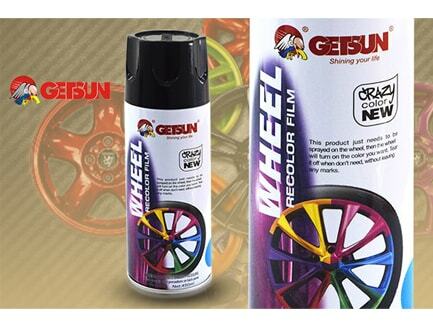 With GETSUN Wheel Recolor film, it’s easy and affordable to customize your rims as often as you’d like. PREPARE: Before you start, wash your rims with soap and water, rinse, and then let them dry completely. This ensures that your paint applies evenly and removes correctly. Next, weave a garbage bag behind the spokes of each rim to protect the caliper, brake pads, and brake rotors from paint. Then use painter’s tape to cover the lug nuts and air valve stem. To protect your tires, drape a garbage bag over the whole tire and use a utility knife to cut a hole around the rim. Be careful not to cut into the tire. Tape the bag in place to cover all of the tire. Then, place index cards overlapping between the rim and tire for a clean line around the rim. PAINT: To start painting, first shake your can of Peel Coat for one minute after the mixing ball starts rattling. To apply your first coat, hold the can 8-12” away from your rim and spray in a back-and-forth motion, slightly overlapping each stroke. You should aim for about 50 percent coverage on your first coat, meaning you can see about half of the rim through your first coat of spray paint. Then, apply four or more additional coats (allowing five minutes in between each) to build the coating. The more coats you apply, the easier it will be to remove the paint when you’re ready. 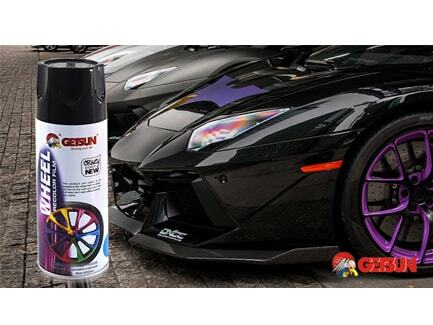 FINISH: Immediately after applying your final coat, carefully remove the painter’s tape and index cards from the tire. Then, wait for the paint to dry to the touch before carefully removing the garbage bags. Let your new rims dry for at least 24 hours before taking them out on the road. Once dry, your new rims will withstand rain, car washes, and regular wear and tear from driving.